Soldering-guide - Soldering Guide - How to. Soldering Guide - How to. How to use a soldering iron? Repairing your electric devices may require you to learn the art of soldering. 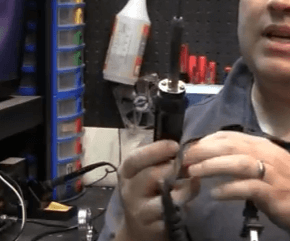 Even though people have less patience to do this job by themselves it is important to learn about the important aspects of soldering irons in general. If you are interested in learning a new hobby in your holidays then the art of soldering will be the exact choice for you. In learning this specific art will help you to use your free time in an efficient manner and this will also provide you some additional incomes in the form of repairing things. It is a process of joining two metals with the help of heat application and a filler is used to make this joint done. Usually led is used as a filler material in the process of soldering though many such elements are found in usage. Yet another thing to be noted about soldering is that this is different from the process of welding. Because welding though uses application of heat, it melts the material to be joined. But soldering do not melt the two pieces that need to be joined rather it melts the filler material. For this purpose a soldering iron is used and now you are going to learn something important about this magnificent work piece. The soldering iron has a heated tip made up of metal and this is used to melt the filler material. The user will get a handle that is used to insulate them from the heat of the tip and you need to get a stand along with this soldering iron in order to carry on safety measures during operation. This tool uses a solder material usually made up of alloys. This is a piece of ring like material melted in order to joint two other pieces. Lead free solders are also used in many components when their usage useful. This tube like material also contains yet another important material called flux. This is responsible for fixing the individual materials because they solidify after without the help of the oxidation. The power source used to create the heat required is electricity in most of the cases. But you can adjust the temperature of the soldering iron depending upon the usage of the soldering iron. The first thing to do in a solder iron rod is to clean the tip because it should be free from the previous particles in order to achieve proper temperature. Because previous solder present in the tip will insulate the iron from heat. The filler material will solidify just moments after the heating process so you need to provide heat to the handle once gain so that it is easy to remove the previous solder with ease. Every time you us the ironing rod it is good to re tin the rod because it will help in increasing the life span of the rod. Before proceeding with your process, it is important to ensure safety-working environment. Many people really care about the damage of the pcbs only but the truth is your hand needs much protection than the pcbs. Can you imagine the temperature of the handle that is enough to melt even the metals and when it touches a minor part of your hand, it is hard to escape from their hot temperature. After this process, hold the handle with your dominant hand and the solder in other hand. The reason is that the handle needs precise operation and when something goes wrong with the handle the entire process will be spoiled. After fixing the spot, you need to place the solder in the area that needs a joint. By the help of your tip, you need to melt the solder. Hold the handle for a second so that the solder fixes into the joining spot with ease. Within a few seconds, the joint becomes hard by the help of oxidation. You need to pull the solder first and after this process hold the iron tip for yet another second so that the solders fills the joint properly. However, to get the soldering process complete you need to wait for a few minutes without disturbing the fix. Because while moving the joined parts it is going to reduce the quality of the soldering joint. While removing an older solder you can use the iron tip to melt the older solder and continue the above process for a new solder. However, if you need to make it simple then re soldering on the previous joint is the only easy way without any complexities. For removing the old solder, you need to use a solder sucker, which works on the principle of a vacuum suction. Therefore, re soldering the previous joint will not require these new tools and takes only limited time.